Agriculture provides jobs for 3,756 La Crosse County residents. Agriculture accounts for $977 million in economic activity. Agriculture contributes $218 million to the county’s total income. If you would like to know more about National Ag Day and how you can promote agriculture please visit https://www.agday.org/. 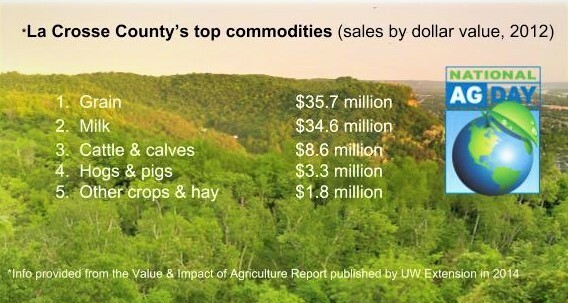 If you would like to learn more about La Crosse County Agriculture statistics you can find the Value & Impact of Agriculture Report here https://blogs.ces.uwex.edu/anre/files/2015/01/La-Crosse_2014.pdf.